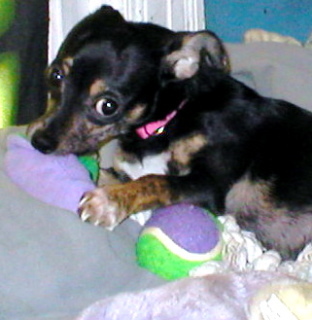 Jezzi is our precious little Chihuahua. She rules the roost and doesn't let us forget it. We delight in her antics and often laugh about her daily habits. First, you must know that Jezzi is a creature of comfort. She has to sleep in the bed with my roommate and must be under the covers because she gets chilled. We can't have a chilly Chihuahua, that would not do. If she gets too warm under the covers she crawls out, rolls over on her back with her paws up in the air to let the heat be released from her hot little belly. Jezzi looks like an armadillo on the side of the road when she does this. She follows this pattern throughout the day because napping is what Chihuahuas do best. Jezzi has a set routine at dinner time too. She first begs whatever morsels she can get from us. We cannot deny her this "just due" because if we do she gets her feelings hurt. Once she realizes that we are not going to give her any more food, she will go to to the kitchen, pick up her little container of food, race to the bedroom with it as if someone is going to take it away from her, put it on the second step of her doggie stairs and eat it. As soon as her food is eaten she will go in search of a toy and try to "seduce" one of us back to "her" (roommate's) bed to play. Jezzi only thinks she can really, truly play on her bed. After playing for about 30 minutes, it is nap time and Jezzi will sleep off and on for the rest of the night. She follows this pattern every day without fail. We call her OCD dog. One other habit of Jezzi's involves when we leave the house for a while. Jezzi gets "fenced" into roomie's bedroom while we are gone because she likes to get into things. When we leave she gets snacks. Among those snacks will be a raw hide stick, bone or "knot." Ms. Jezzi will eat up her other snacks but saves the rawhide snack until we get home. When we arrive back at the house and let her out of the room, she runs through the house like she is on fire, then she will have to find something to "bite" a box, a dress, something, anything, she just bites it to show she is happy. She doesn't tear it up. It is just a gentle happy bite. After that she will happily gnaw on her rawhide treat until, well, she gets sleepy and has to take another nap, after all, it is hard being a little Chihuahua.